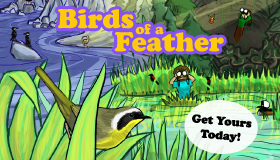 Birds of a Feather is one of the few games that make use of a supplemental app. Image from Board Game Geek. It will be a surprise to absolutely no one that technology is slowly creeping into the world of tabletop games, just as it has in every other facet of life. What might actually be surprising is how slowly the creep is. Especially considering the wild success of mobile games and the ubiquity of smart phones, you might expect more tabletop games supplemented with apps. Why are tabletop games lagging behind so many other areas where technology is embraced without looking back? Today I’m going to discuss how digital technology fits into tabletop games. I’ll look at what’s currently holding it back and where I expect it will go once the flood gates finally do open. With digital technology rapidly being adopted in nearly every part of modern life, why are tabletop games slow to embrace it? I believe there are a number of reasons. 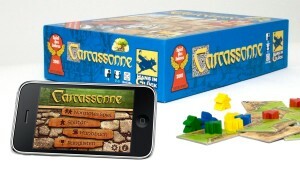 Many players have enjoyed Carcassonne through the app, but the digital and non-digital versions do not work together. But before that, it is worth noting that digital technology is beginning to make an impact in the hobby. I’ll go over a few examples later, but perhaps the most significant way digital technology makes an appearance in the industry is through digitized versions of tabletop games. Games such as Carcassone and Star Realms have extremely successful digital versions, and while players don’t combine them with the actual tabletop experience, they serve an important complementary role for the tabletop games, helping to teach the games as well as advertising them. 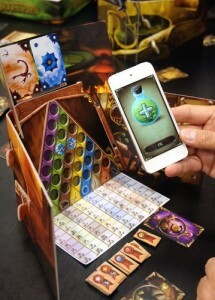 So what’s keeping digital technology from being integrated into the tabletop experience? Luddites. Gamers are a surprisingly conservative bunch. For many gamers, the table top is a sacred space where digital distractions are not welcome. Just see how quickly this thread on Board Game Geek about Birds of a Feather derails into an anti-app rant. There is an immediate resistance to the app, even though the experience of using it is extremely similar to using a score sheet and it actually prevents smart phone distractions because it completely occupies players’ smart phones. The very idea of an app is enough to inspire a grumpy and negative reaction. Honestly, you can’t blame these Luddites. Digital technology has infiltrated much of our lives, and many people have to use it all day for work whether they want to or not. Tabletop games are an escape for these people, so it’s easy to understand why they’d want to defend that escape. Will this change? Definitely. But it may take a shift of generations. 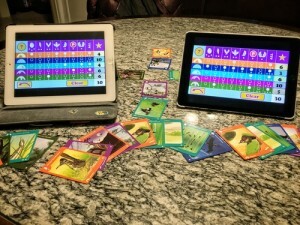 Kids that grow up today cherishing their smart phones will be happy to incorporate them into their tabletop games, and once they have become the dominant consumer force in the industry, publishers will be much more willing to release a game with a digital component. While the Birds of a Feather score keeping app has been well received, we have heard complains about batteries dying mid-game. Image from Board Game Geek. Unreliability. Phones have gotten a lot better over the years, but they’re still less reliable than cardboard in a couple of ways. First off, even though they seem to keep getting more expensive, their batteries seem to last less and less time. This is a huge turn off for a lot of people. It’s very frustrating when you’re in the middle of an exciting game, and all of the sudden some real world inconvenience, like a low battery warning, interrupts your experience. Second, digital infrastructure is constantly changing and splintering. Theoretically, it’s always improving. But in practice, it’s frequently obsoleting old software. For well funded, fast moving software companies, that’s not an issue. But for slow moving tabletop publishers, that often means that apps that used to work really well suddenly stop working for months, or possibly permanently. How frustrating is it when you want to play an old favorite game, only to discover that the steady march of technological progress is preventing you? Cost. In some ways, apps are cheap. You don’t have to manufacture them or pay to ship them around the globe. But in other ways, they’re expensive. They require expertise that many tabletop publishers lack, and they take a lot of time to produce well. Perhaps most significantly, apps require maintenance as software evolves and new devices are released. Compare this to cardboard, which costs very little to maintain after it has been produced in the first place. Given the extra costs and the lukewarm reception by many gamers, it’s no surprise that publishers are apprehensive to develop games that have supplementary apps. Design. When mobile devices first became widespread, many designers simply tried to port existing games to the new platform. This led to awkward games. It took time for designers to understand how to make use of the new platform, to make games that worked well with the constraints and affordances of the new medium. The same is true for tabletop games that make use of digital technology. Obvious ways of combining them may not work particularly well, but the possibilities are nearly limitless. It will take time for people to discover effective ways to use the new technology. There are obstacles to digital technology being integrated into tabletop games, but they are not insurmountable, and I believe that we’ll see more and more games incorporating digital technology. Here are a few of the ways it’s being used effectively today. The Alchemists app greatly improves the game’s play experience. Image from Board Game Geek. Alchemists. Perhaps the most famous example of a supplemental app is Alchemists. In Alchemists, players combine different ingredients to unlock the secrets of alchemy. The app helps in two ways. First, there are countless possible ingredient combinations, and the app will instantly look up and report the results of any particular combination. Second, the results of combinations are randomized each game, to help keep the game fresh each play. So the app acts as a giant lookup table and randomizer. 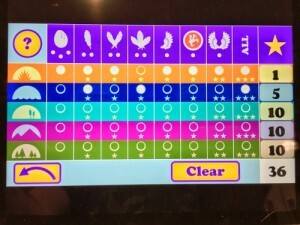 If players don’t use the app, a sucker (sorry, I mean player) will need to look up all of the combinations for the other players. One Night Ultimate Werewolf. Anyone who has played hidden identity games knows that someone has to GM the whole experience, especially the beginning when certain players learn about the identities of other players. And that GM better know what they’re doing, because any minor slip up could spoil the entire game and force the large group to restart the whole experience. The supplemental app for One Night Ultimate Werewolf takes care of this, narrating the game and stepping the players through the setup. This app is useful because it automates a lot of the monotonous and finicky set up of the game, especially important for a game with many possible identity combinations where remembering the order for them all is quite a chore for a human. Birds of a Feather. Our recent bird watching card game, Birds of a Feather, plays like a trick taker with a few important differences. One of those differences is that multiple players can score off of the same card. This means that players can’t use the cards themselves to keep track of score. Instead, players use a score sheet… or an app. The app works just like a score sheet, keeping track of the cards you’ve scored and doing a little math for you. Don’t let the fact that we call it a score sheet replacement confuse you… the app for Birds of a Feather is a memory aid more than anything, keeping track of the game state so the players don’t have to remember it themselves. Based on these successful apps, what do I predict for future apps? A few things. Optional. The first thing is that, at least in the near future, apps need to be optional. Requiring an app will just turn off too many players. If players can play the game without the app, then try the app and realize it will make the play experience smoother, the game has a much better chance at success. This may not be a requirement in the distant future (say 10 years), but for the time being I would advise not requiring an app to play your game. Computational. Years ago I wrote about the advantages a computer has over a human in terms of running games. For an app to actually be useful, it needs to make use of at least one of those advantages. All of the apps I described above harness such advantages: they assist in memory, or they automate monotonous tasks, or they internalize rules that are difficult for a human to enact. If an app doesn’t do something similar, it’s unlikely it will contribute enough to be widely adopted. Easy to use. If an app is inconvenient, it’s not going to be used. Whatever it does, it needs to cure more headaches than it causes. Good UI and a focused purpose are both important for this. Don’t get tempted to bloat an app with lots of features if it makes it more difficult to use. One area I believe will really improve ease of use is computer vision. If players can simply point their phone at the game components of interest, they are far more likely to use an app than if they have to manually enter information. Focused on non-digital fun. When people think “app” in tabletop games, they usually think “gimmick”. While there is room for some gimmicky uses of apps, I think that ultimately apps will fit more of a supplementary role, supporting the aspects of board games that are traditionally fun. If the app is the real center piece, you have to ask yourself, why have the non-digital component at all? I’m excited to see how tabletop games embrace digital technology moving forward. I believe it is inevitable that there will be more and more overlap, and I’m proud that Birds of a Feather is helping take the industry in that direction, even if it has inspired negative reactions from some people. While some obstacles to tabletop integration of technology are outside of our control, as designers and publishers we can still push the envelop by taking chances and experimenting with the unknown. I would like to thank my generous Patreon patrons for the support and inspiration that made this article possible. Seriously, though, for the BoaF scoring app: if people don’t want to use the app, they don’t have to. The game comes with score sheets. Anyone complaining about the existence of a completely optional player aid is wasting their breath. I agree with you. But I think for a lot of people it’s a knee jerk reaction they make without learning the full story. “App” is a bad word to them. Have you had a chance to check out the XCOM board game? My understanding is that relies much more heavily on the app than your other examples, but it’s still become quite popular. I have not, but that is an excellent example. Looking at the BGG description (about 2/3 of it is dedicated to the app), it sounds like the app acts as a real time GM, driving the random experience forward each game. It looks like it’s necessary to play the game, which goes against what I said in the article. I wonder if the tabletop game being based on a digital game franchise makes people more tolerant of a required app? XCOM is an expansion of a phone game into meatspace, opposite how many of the other games listed are board games being ported into cyberspace. This serves a different role in the spectrum of gaming, and so doesn’t need to follow the exact same rules. I am not familiar with the XCOM board game either, but I think there’s another aspect that you should consider. In most of the examples you’re looking at, you’ve got primarily a board game with some added (often optional) functionality from an app. It sounds like XCOM is mostly an app-driven game, with some added functionality from a board. I think that’s an interesting concept that is inherently different from the original one posited. If most of the game is on the app, and you’re using a board to keep track of movements and visualize the entirety of the game, you’re taking what would normally be a solitary phone game and instead expanding it into a social event. I’m both a software developer and a gamer of all sorts – pencil & paper, computer, console, and board – and I expect a different thing out of each. Computer games are a broad swathe, but for the others I have a general expectation of what I’m going to get when I choose an activity. Pencil & Paper RPGs are largely a creative social endeavor, and when I delve into them I expect to have a primarily social experience hanging out with friends, with some interesting creative discussions and ad-hoc decision making. The layers of rules that accompany them are sometimes rolling dice, sometimes looking up rules, sometimes moving things on a board, but that is not the primary goal of the game, just a supplement, and as such I always attempt to incorporate any automation possible that will allow me and my co-gamers to focus on the creative/social goals rather than getting bogged down in the details of the rules. Where board games are concerned, I’m mostly looking for a social game, which makes sense because the term “board” game revolves historically around the board, a physical object around which the players seat themselves. Apps and automation can accompany this, but typically the “public” game state is visible to all — the “private” game state would be your strategy and your hand, both of which are hidden to other players but can possibly be inferred if they are clever. An app taking part of the “private” game state is a step further in the app direction, but is not really inherently any different than having a face-down deck and a hand of hidden cards. I view a game like XCOM (which, as I said, I haven’t played, so grain of salt here) as a board game with a private game state driven by an app. Instead of drawing a set of cards and consulting a table, you simply consult the app to see what happens next. Instead of the app serving as a tool to enhance the gameplay, it’s as necessary a piece as the infection deck in Pandemic. Essentially, you’ve taken a multiplayer phone app and converted it into a social game. I think part of the reason this is effective is because of physical limitations of phones; if you wanted to strategize with another player and you didn’t have a board, you’d be limited by your phone screen to view the board. Furthermore, if you were trying to play alongside a friend, you’d have to hold your phone up and point to the spot where you were planning on moving your guy. Sure, maybe that could be handled by “pings” on the map in the phone game, or added UI “move preview” elements, but often people *want* to play a board game, and making that conversion into the physical realm encourages social interaction without losing the randomness and hidden elements the app handles for the players. Additionally, as far as game development goes, some of the UI features in a full phone-app required to establish parity with the hybrid board-phone game would require a substantially greater effort than merely providing the physical pieces. Overall, I think that XCOM is the black sheep in the discussion here, and is a frontrunner in what may be a new series of games, utilizing augmented reality or automated gamestates to drive an experience that is “tracked” by physical elements. While providing a necessary app for something that can be simulated by a deck of cards or dice might be overkill, there’s nothing wrong with spinning a social event out of what otherwise might have been just a game on the computer. Interesting approach… so players are more tolerant of XCOM’s app because it IS an app with a supplemental board and miniatures? I could see that. Nintendo’s amiibos are another example of digital games gaining a non-digital component. On the flip side, I’m not sure if this phenomenon is totally new. Growing up I had a VHS game called Nightmare (very weird game). Similarly, the bird watching game made famous by Flip the Table, Gone Birding!, uses a VHS tape to drive the action. More recently, Vlaada Chvátil’s Space Alert! uses tracks on a CD as a non-physical way to propel the game. Theoretically, these supplements add real time elements to games, but could otherwise just be done with cards or other physical components. In practice that might be too impractical. Ah, interesting, I had forgotten about games like that. Hi Teale! This is Michael – we’ve met a few times at Celestispiel events and at Locally Grown Sundays, but chatted most recently this weekend at DunDraCon. I was poking around looking for contact info and read the blog. I’m actually VERY interested in the topic of the digital age’s influence on tabletop; I’ve been mulling on it for some time. I think that the digital might spook some tabletop folks for the reason Vorsgald mentioned: loss of the social. Vorsgald makes the argument – and a valid one, I think! – that the element of the social is primary in RPGs, and central in tabletop games as well. I think digital interfaces might prove a bit more troubling for straight resource management or other tactical/competitive games simply because, at a very basic level, a lot of the investment time needed to learn a new game can be avoided when an app can handle the mechanics smoothly. Everyone’s had the “social” experience of playing video games with friends, whether online or in person, but there’s an interactive, conversational, creative element that’s lost – your eyes are no longer on each other, and perhaps this is a bit primal, but you’re no longer doing that very primal, instinctive transaction: handing THINGS to one another, exchanging objects to build competitive and collaborative and, ultimately, SOCIAL relationships. In addition, there’s another analog edge that I think can’t be underestimated. If anything, I think it may be the core of what I consider “the analog advantage”: collaborative creativity. The ONLY thing, I would argue, that an old-school tabletop can do that digital games have been unable to manage is incentivizing and inspiring collective story-telling. Digital game, to an extent greater even than tabletop games with iconic printed components, are consumption focused. You are placed within the world of the game and operate within its rules; you do not CREATE that world and collaborate to generate its rules. With that said, you’ve got me thinking about the overlap, and the potential there for new, blended systems. Using phones to allow for games with “secret” and “betrayal” elements is a pretty fascinating concept! Originally, I’d thought to have phones incorporated into Genre. The idea was to have a “performance” element required: a visual, narrative, dialogue, soundtrack, or gesture that had to be incorporated when you played a trope. The idea was that if you changed the soundtrack, you’d really play something on your phone; if you couldn’t narrate what happened, you could search up a visual to crack up the table and get everyone to envision what your characters were up to. This turned out to slow things down rather than speed them up, however; in practice, it added another step that disengaged players from the collaborative storytelling rather than submerging them in it. Thanks for the discussion, and hope I have a chance to play Birds of a Feather coming up!